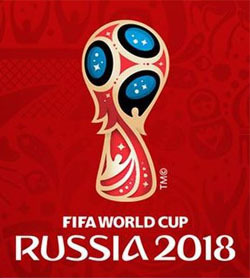 The 21th FIFA World Cup was held in Russia from 14 June to 15 July in 2018. It was the first time Russia hosted the tournament. After a qualification process including 210 teams, a new record, it was finally 32 teams left to compete for the trophy (the team of Russia as host nation was automatically qualified). Iceland and Panama managed to qualify for the first time. The thing many talked about before the tournament and after it started was the novelty video assistant referee system (VAR). For the first time in the World Cup, the decisions of the referee could be changed after reviewing the situation by the use of video footage. In addition, situations that the referee had not reacted upon could result in retrospective action by communications from assistant referees with access to video footage. It was a big step and the system seemed to be of great importance in several games. For example, in penalty situations in which the referee now chould chose to review the situation through video before the taking a final decision. The very first time VAR affected the outcome of a decision was in the match France-Australia, in which France was given a penalty based on video assistance. One of the plausible VAR effect to suspect was therefore a higher goal average than normal. The goal average was indeed higher than in both 2006 and 2010, but not higher than in 2014. The Luzhniki Stadium with over 78,000 seats. The matches would be played at twelve stadiums in eleven cities. 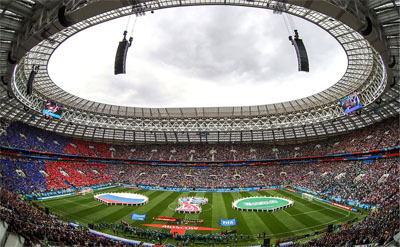 The final would be played at Luzhniki Stadium in Moscow (attendance 78,011). The host nation Russia with a fourth place from 1966 as their so far best World Cup performance was the lowest-ranked team by FIFA, but started in impressive style by beating Saudi Arabia with 5 to 0. They continue to play above expectations by beating Egypt with the hyped Mohamed Salah on field. Uruguay led by the forward duo Luis Suárez and Edinson Cavani, would beat Russia in the third group match by 3-0, however both teams would go on to the knockout stage. Russia would be involved in two dramatic games in the knockout stage. In the Round of 16 they won after penalties, eliminating Denmark. In the quarter-finals it was their turn to face the bitterness of losing after a penalty-shoot-out. A few of the favorites was in trouble in the group phase. Spain and Portugal in Group B could not be sure on advancement until the final blow in their third games. Argentina would also be involved in a close struggle for the advancement to the next stage, but could secure a ticket to the Round of 16 in the third game. Germany had, however, to leave the tournament after three games after being last in the group and a humiliating loss in the third match against South Korea. Before the 2018 tournament, only eight nations had ever lift the World Cup trophy. When the tournament was reaching the semi-finals two of the teams, Belgium and Croatia, wasn’t among these. France would win the first game against Belgium and Croatia would win the second semi-final after England had been one goal ahead. By that, Croatia could be a new nation to win the FIFA World Cup. It was yet France that prove to be to strong and would win for the second time (first time in 1998). FIFA World Cup 2018 included 64 matches in which 171 goals were made (2,64 goals per match). 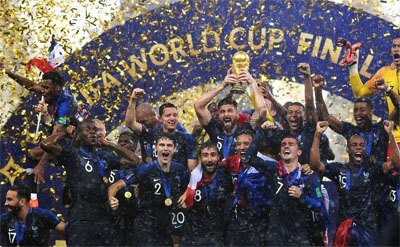 France won the final against Croatia with 4-2 (most goals in a World Cup final during ordinary time since 1958). France celebrates after the final.